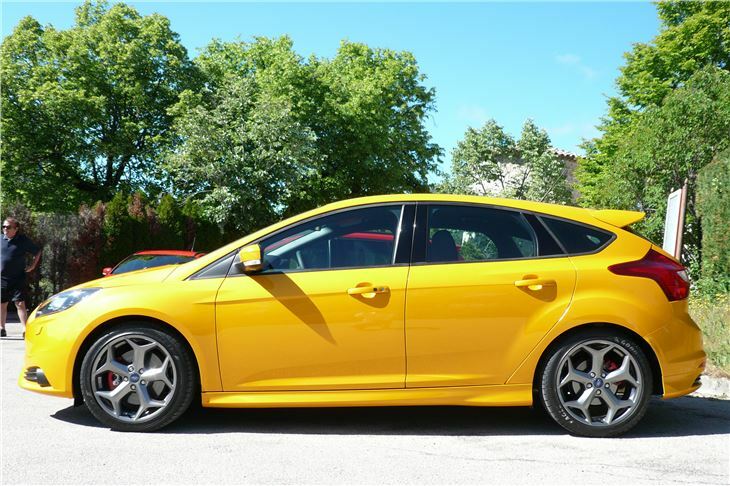 The Ford Focus ST is a case of ingenuity born of compromise. 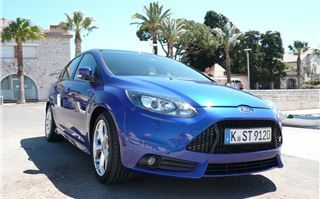 No 3-door ‘coupe’ in the Focus line-up. But there is an estate. 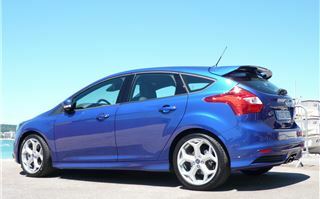 And in Switzerland and Germany orders already indicate that it is outselling the 5-door hatchback. 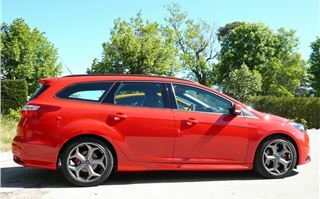 So the estate, or ‘wagon’, as our Transatlantic cousins prefer to call it, was the first Focus ST we drove. 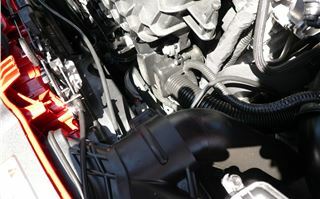 They all have a chain cam 2.0-litre manifold in head turbocharged engine derived from the one in the 2001 Mondeo III. This is not a bad thing because, apart from an early issue with intake manifold swirl flaps, the engine is almost incredibly reliable. 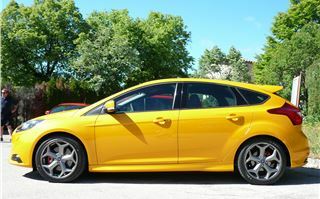 In the Focus ST it pumps out 250PS at 6,000rpm, 340Nm torque at 1,750rpm and 360Nm from 2,000rpm to 4,500rpm. Coupled with short gear ratios equating to 23mph per 1,000rpm in 6th, that makes it very punchy indeed on mountain roads in 3rd and 4th gear. From inside the cabin it sounds good too. To emulate the sonorous delights of the 5-cylinder Volvo engine in the previous Focus ST, Ford’s engine men have installed a gizmo on the inlet manifold called an “Active Sound Symposer”. 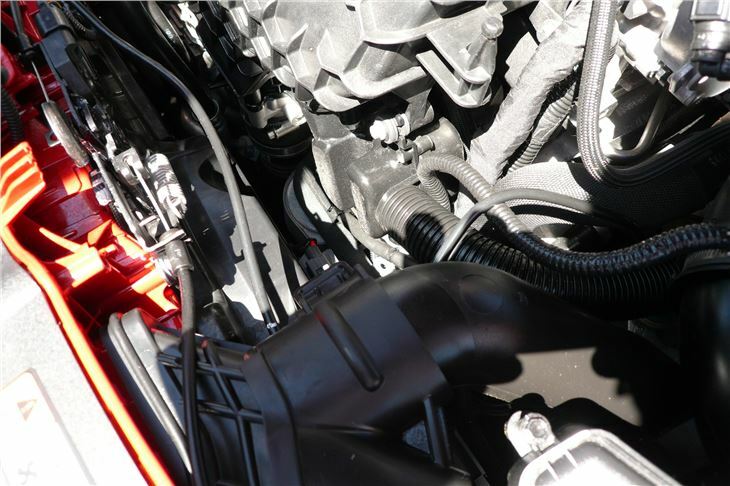 This takes unequal engine-breathing noises from different parts of the inlet manifold and feeds them into the cabin. So you hear as well as feel the engine working when you’re giving it some beans. It’s addictive, yet not wearing because a flap valve in the system cuts the noise when you are not accelerating hard. 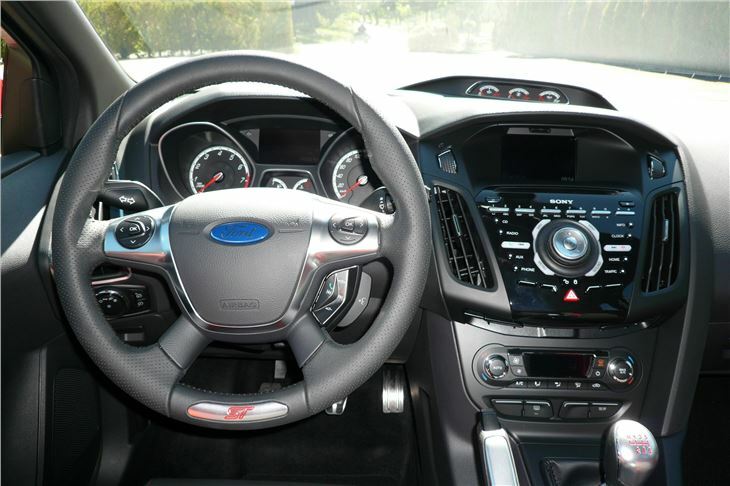 To get the power down, yet also provide an element of feel, there is electronic “torque compensation”. Added to that, three levels of ESP (including ‘off’) and a variable ratio steering rack that helps the car track straight on the motorway, yet cuts the amount of wheel turning needed for hairpin bends. This both works and doesn’t work. 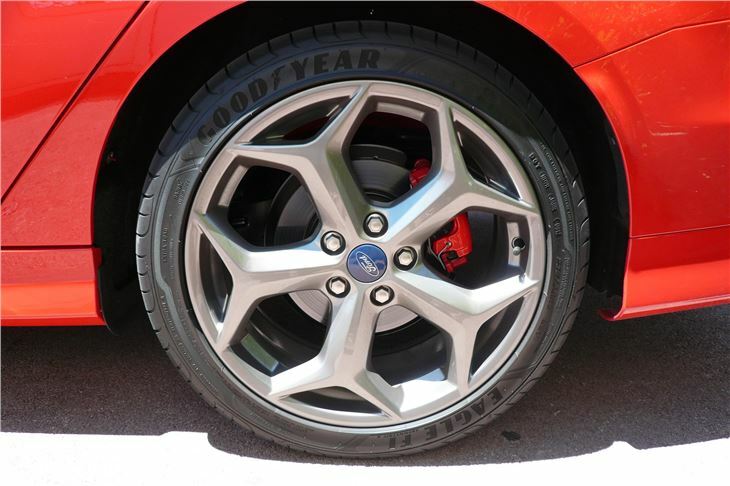 On the ‘wagon’ we tried first, both wheelspin and torque steer were quite pronounced, especially on uneven surfaces. Strangely, switching the ESP completely off calmed the car down and made it much nicer to drive, which suggests a possible software glitch in that particular car. Or slightly uneven tyre pressures. Or that the suspension was a bit misaligned. 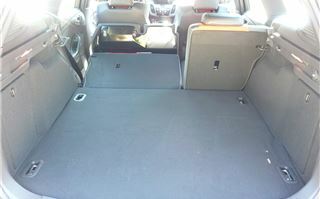 Or that the wagon behaves differently from the hatchback. 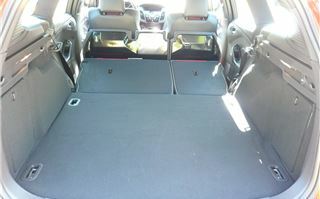 In the hatchback next day, no problem at all. It was sheer joy to drive on what are probably some of the best, quietest and most gendarme free roads in Europe. Neither of us felt the slightest need to turn down or turn off the ESP. We were both very happy with the car the way it was. 2nd was only needed for the tightest and steepest of the hairpin bends. Most of the time we were in 3rd or 4th and very rarely found we’d picked the wrong gear for a corner. The massive torque from 1,750rpm simply pulled the car cleanly round. 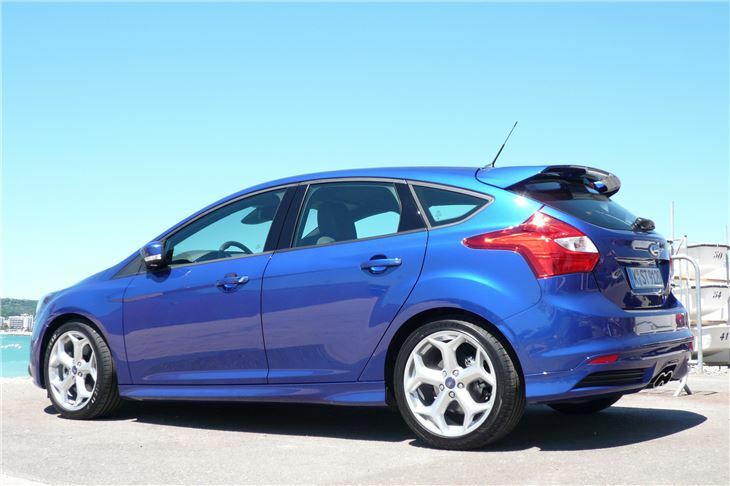 Don’t, however, expect to match the EC combined economy figure of 39mpg. Sticking to speed limits I’d say maybe 35-40mpg on the motorway. Cross-country, nearer to 30. 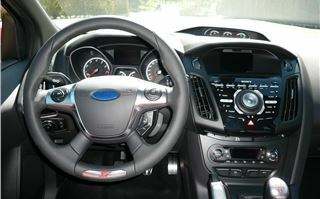 Inside, you’re presented with a nice array of clear dials in front of you, plus a binnacle with three more on top of the dash to make you feel like a rally driver. I’d advise you not to stint on the options. Definitely go for the small screen but accurate DAB satnav and ‘Driver Assistance Package’ (details in the ‘specs’) that between them will set you back £1,600, but are worth it. And if you’ll be spending a lot of time on motorways, be sure to spend £200 on optional cruise control as well. 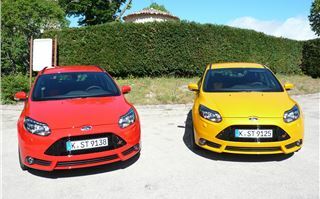 In ‘Tangerine Scream’ orange the Focus ST hatchback has to be the pick of the pair. 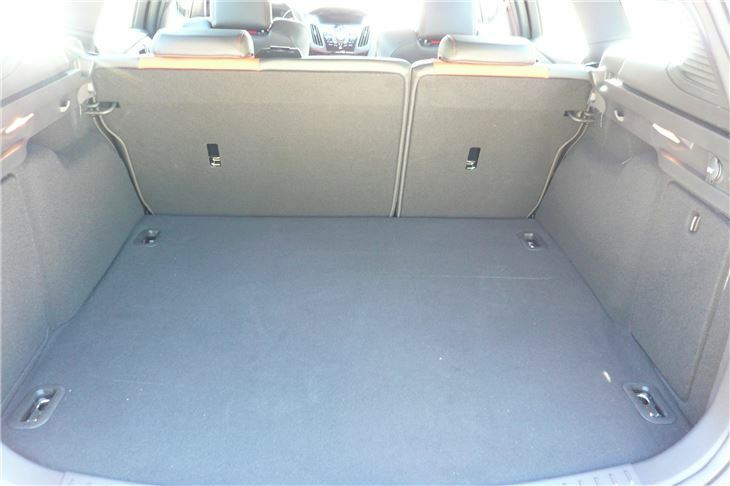 But, like lower powered Focus, it doesn’t have a lot of luggage space. The wagon, on the other hand, has an abundance of it. 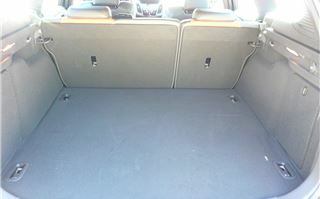 476 litres with the back seats up. 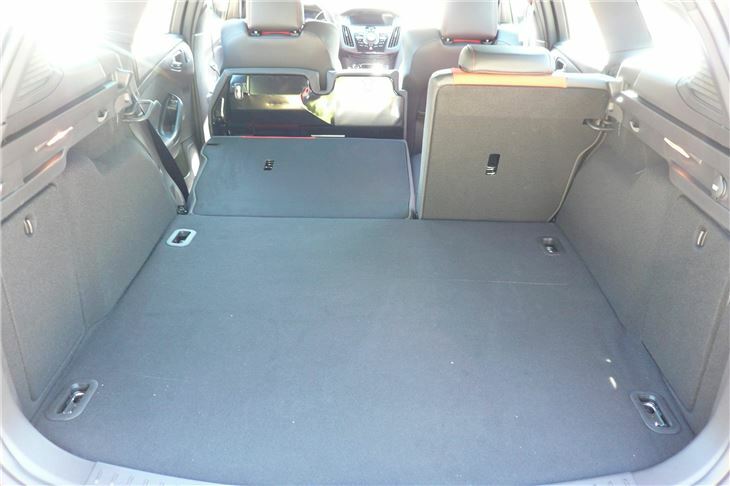 1,502 litres and a completely flat load deck with the back seats down. Not only that, unlike some other makes and models of station wagon, the bases of the folded rear squabs are completely encased, rather than presenting an unappealing display of naked Styrofoam. And, of course, what that means is that keen drivers whose wives are expecting a second child, or who already have one, don’t have to give up driving a decent car. 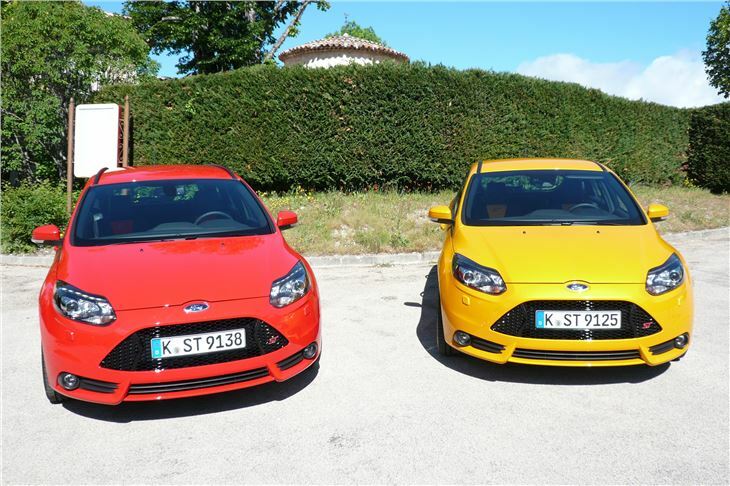 A RenaultSport Megane or an Astra VXR or a VW Scirocco may be out of the picture. 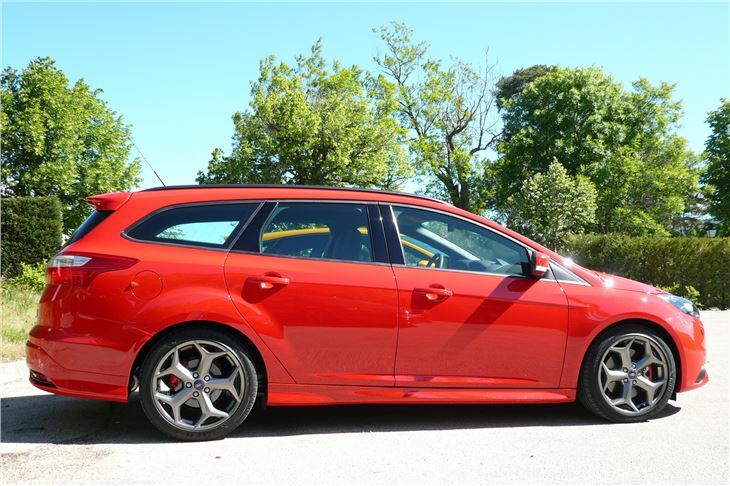 But a 154mph £23,000 Focus ST Estate certainly isn’t.